When you are feeling as sick as a dog, it doesn't really matter what you watch, as long as it doesn't make your head hurt. YouTube decided Arzoo was just what the doctor ordered. 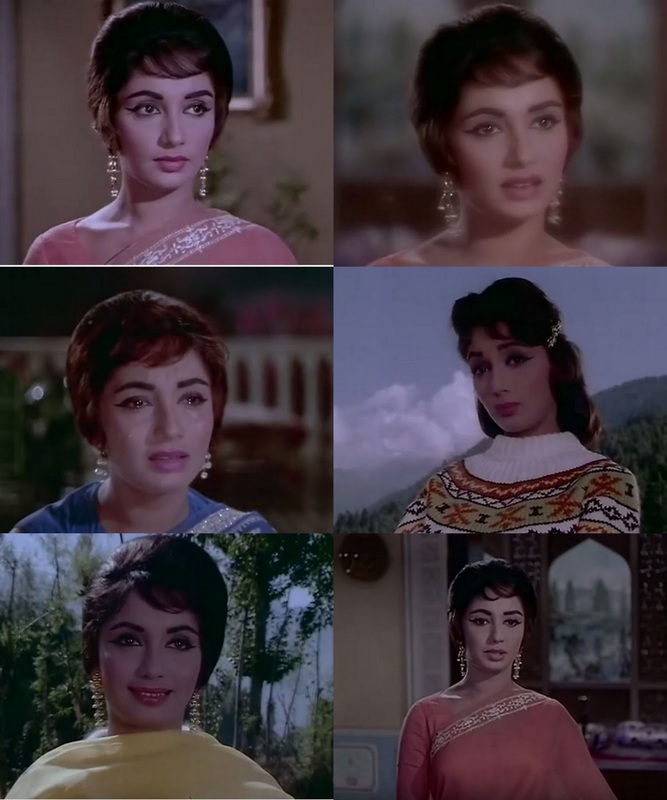 Now, Rajendra Kumar doesn't usually float my boat, and unfortunately, neither does Feroz Khan, but I love Sadhana, and this had pleasant songs as I remembered. 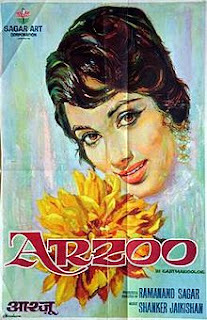 Besides, I'd no particular movie that I wanted to watch at that point, so Arzoo it was. Gopal (Rajendra Kumar) has just made his way through the throng of students looking up their annual results when he's surrounded by his classmates and friends - he's come first in the university. (Of course he has. He's the hero. And it doesn't matter that he looks far too old to have been a student anyway.) His fond mother (Achala Sachdev) and sister, Sarla (Nazeema) are pleased as punch - he's lit up the kul ka naam. (Well, to be fair, only the mother says that.) Apparently, he's now become a doctor. On hand is also Ganga chachi (who seems to have taken over from the obligatory Ramu kaka as the family retainer) who's already made laddoos for her charge. (And why wasn't good old gajar-ka-halwa good enough for our hero, she asks plaintively.) Everyone's busy scoffing laddoos and feeding each other when a bell sounds continuously from the upper floor. It appears that Gopal and their next door neighbour, Ramesh (Feroz Khan) have a unique setup to summon each other. Unfortunately, Ramesh's father (Brahm Bhardwaj) throws a spanner into their plans; Ramesh has to go to Kanpur to deal with some business tenders. Not all his pleading melts his businessman father's heart. Let Gopal go alone, says he, quite heartlessly. (What will Gopal do alone in Kashmir without his beloved friend?) And sure enough Gopal demurs against travelling alone. It takes the combined efforts of Ramesh and Sarla and maaji to get him to agree, with the caveat that Ramesh will join him a week later. Finally, however, Gopal is on the plane, seated next to a woman who's so dashed unpleasant that I honestly can't blame him for wanting to be with Ramesh instead. Turns out her name is Usha (Sadhana), and she continues to be so unfriendly, indeed very nasty to him, that he is forced to switch seats. But finally, they are both in Gulmarg, and Gopal is taking part in the skiing competition - only, he is Sarju of Okhla village. (There's a backstory to this change of name, which is explained in a throwaway line at the beginning of the movie.) Needless to say, Sarju of Okhla village wins the competition. (Were there any doubts? He even stops midway to let everyone else pass him, and still manages to come first.) That's more than enough to endear him to Usha's uncle, Major Kapoor (Hari Shivdasani). Usha is more than pleased to meet him, but Gopal snubs her, much to her chagrin. The next day, she runs into him again. Their meeting does not go any better. In this, they are helped by Major Kapoor and his wife, who happily invite 'Sarju' to dinner, where the cheerful Major Kapoor insists on Usha entertaining the gathering to a song. When she demurs, both her uncle and 'Sarju' decide to sulk. But by the end of the song, she's made her feelings quite clear. Unfortunately, she has to leave Gulmarg the next day, but she manages to sneak her telephone number to Sarju before she leaves. Which leads to some amusing contretemps when Sarju attempts to telephone her. Once they get past that obstacle, Usha sneaks off to meet Sarju; she's a very trusting soul - she knows nothing of him except his name (and not even his real name at that), but all she wants to know is if he will keep faith with her. Which he assures her, he will. Ramesh informs Gopal's mother and sister about his newfound love, and promises to vet Gopal's girl alongside his own. Unfortunately, his plans come to nought - Gopal is returning home the day after, since he has received a job offer from a hospital in Delhi, and they want him to take charge as soon as possible. In the meantime, however, he's busy entertaining the gathering at Usha's birthday - as Hakim Saheb, her friend 'Salma's' father. It's a disguise that lasts only until the evening lasts. A shaken Dewan Kishan Kishore (Nazir Hussain) wisely lets the matter rest until the morning. But when Usha is sneaking out to bid goodbye to Sarju before he leaves, he stops her from leaving (by the simple expedience of locking her in her room). The intrepid girl jumps out of her balcony and manages to meet her lover. She wants him to meet her father, but the flight is already been held up, and Sarju has to leave. He promises to come back that weekend to meet her father and tell him all, but is forced to board the plane before he can do more than explain he is not actually 'Sarju'. Meanwhile, Dewan Saheb has just realised that his daughter has flown the coop. Before he can have a cardiac arrest (this is Nazir Hussain we're talking about), Usha walks in. Leading to - cue violins in the background - the 'scene'. But instead, he cries out against a cruel fate that took his wife instead of him, especially if he has to listen to an ungrateful daughter. Ah, well, emotional blackmail can work both ways. Usha promptly melts into a puddle of tears (if you will forgive that mixed metaphor). And baap and beti kiss and make up. While they are talking, Ramesh lands up there, all bright-eyed and cheery. Dewan Saheb informs Usha that Ramesh is the man he had picked for her to marry, but she's not to worry. He will not take any decision until after he meets 'Sarju'. But he would like her to take care of Ramesh while he's their guest. Meanwhile (this story has many 'meanwhiles' as Dustedoff once said), Gopal has decided that he cannot tell his mother and sister of his accident. It's going to take him at least a month and a half to recover, so he cooks up an excuse to remain in Pathankot. He also makes an executive decision to 'forget' Usha. She had once remarked how she would prefer to die than be disabled, and Gopal decides (for her) that she's better off without him. Weeks pass without a word from 'Sarju' and Usha is grief-stricken. Her concerned father quietly enquires whether she cannot forget the man who so heartlessly betrayed her love. Ramesh had been singing her praises in Delhi, and Rai Saheb, his father, had written to him. Usha, however, wants to study further - in Delhi. Her father well knows that it is but an excuse for her to look for her Sarju, but he makes no protest. Perhaps she should try that last avenue as well. And so Usha leaves for Delhi. By now, Gopal's wounds have healed enough for him to get a prosthetic foot; he's free of the wheelchair at last, even though he needs a cane for support. Finally, Gopal returns home, cooking up a story of a fall from a horse to explain his limp and his cane. Cue a teary scene with mother and sister, which is interrupted by a cheery Ramesh who demands to know where Gopal has hidden his Kashmir ki kali. That's all bunkum, claims Gopal, made up to alleviate his boredom and to get Ramesh over to Kashmir as quickly as possible. But, interjects Sarla, Ramesh has met his match there. Seeing her photograph, Sarla makes the pleasant discovery that the girl Ramesh loves is her classmate. While Gopal makes the unpleasant one that he and Ramesh are in love with the same girl. Gopal takes charge at his place of work (which begs the question how he does, since he's just passed his MBBS), while Sarla, excited at Usha and Ramesh being in love with each other, promptly spills the beans to her roommate (a grown-up Daisy Irani) and the rest of her friends in the hostel. They gather all the girls together and conspire to tease Usha about her supposed love affair. Usha is both bewildered and hurt, since she's grieving her Sarju's supposed betrayal. Sarla is not unkind, however, and is taken aback by Usha's reaction. However, she's even more shocked by what she discovers when she goes to confront Usha. I did see some things that I cheered for, even amidst all the melodrama. I liked that Sarla took her brother to task, and despite his threatening to kill himself, informs Ramesh of what is happening. I liked that she tells her brother that his 'solution' spelled doom for three people. I liked that Dewan Kishan Kishore is amenable to his daughter's pleas, and indeed, despite his looking like a coronary would carry him off any moment, was quite reasonable in his objections to his daughter's love affair. It was good to hear the heroine (and the best friend) excoriate the hero for his 'heroism'. And despite all the bhaichara and copious use of glycerine, Arzoo is a decent enough watch for people who have a certain level of masala tolerance. If not, there's always Shankar-Jaikishan who, even though the rift in their lute had happened by this time, did come up with a pleasant score. And of course, there's always a stylish Feroz Khan, a not-bad-looking Rajendra Kumar, along with lovely Kashmir, to ogle. Not to forget, a very beautiful Sadhana.